Yesterday morning I went outside to fill the birdfeeders and found a ripe cherry. We have six little cherry trees and I found only ONE ripe cherry. I put it on EJ’s plate when I served him his breakfast. “Where is yours?” he asked. I told him that I had found only ONE ripe cherry. I think the birds ate all the other ripe cherries. EJ was going to cut the cherry in half to share with me, but I urge him to eat it. He loves cherries. EJ said we will probably have to get something to protect the cherries so the birds don’t eat them all. It’s probably too late for this year, but we can maybe get something for nest year. That is a danger in trying to make a yard attractive to birds. They don’t just eat the food in the feeders, they also eat the cherries and berries. After the baby sparrows in the blue birdhouse left the nest, the sparrows had another family. I have been watching Papa and Mama Sparrow bringing seeds to their new family for several days now. Today I got a glimpse of the babies. I love seeing them. I have been watching but have not seen any babies at the other sparrow birdhouse or the one with the wren nest. This weekend is/was our village’s annual festival. I actually thought last year was the final festival, but organizers changed its name and, I think, maybe, reinvented it a little so maybe this is the first annual festival of the reinvented festival. When JJ was little I used to take him to the activities in the town. Our favorite activity was the Book Sale at the library (of course!). JJ also enjoyed making a tie dye T-shirt each year. And there were other activities such as a parade, a frog-jumping contest, belt sander races, and other such things. Now, however–and especially this year–I am not all that interested in the festival. EJ had to work today so we enjoy a quiet morning studying and talking together. 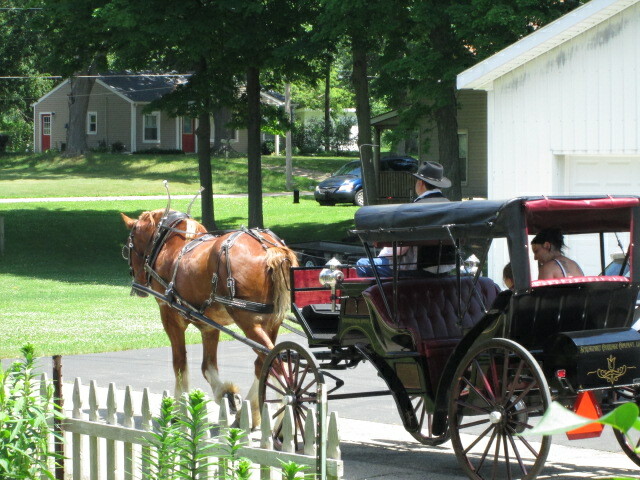 The festival offered horse-drawn buggy rides and we were on its route, so every few minutes a horse and buggy drove past our house. The first time it drove by our house, Timmy and Little Bear were sitting in the kitchen window, and they starred intently at the strange beast clopping by. A little later I let Danny outside and he quivered with excitement when he saw the horse and ran along inside the fence barking. He almost never barks so I know he was excited. After a bit, the animals all got used to the horse going by and didn’t pay much attention to it. After EJ left for work, I took Danny for his walk, along his regular route. I had to keep him on a shorter leash because there were more people around. We walked by the church yard, which was filled with pony rides, a bouncy house, and a yard sale. I’m sure there was a lot of other things do downtown as well, but we didn’t go there. JJ didn’t wake up until late afternoon, so I had a quiet, peaceful afternoon.